Nourishing YOU. Adventures to Healthy, Happy, and a Fulfilling Life! Food is our medicine. Anyone who’s ever tried to lose weight in their life can tell you that it’s not easy. Anyone who’s diabetic can also tell you that weight loss is a constant struggle. Taking insulin is a major component of what prevents us diabetics from losing weight. For type 1 diabetics such as myself, we are provided with a sliding scale that best suits us. However, little does anyone tell you, that your sliding scale varies not only day by day, but hour by hour. What does this mean? For example, if you’re a person who exercises once a day for an hour each day, five days a week, and eats the same foods each meal, then sure – your sliding scale may be the same. But who does that? No one that I know. So what exactly are the variables that create such differences in our sliding scale? Foods Consumed – The obvious one. Fattier foods such as beef, butter, donuts, cheeses etc. will create a major increase in our blood glucose (BG) levels over a long period of time. This can range anywhere from 8 hours to 24 hours later depending on how fast it is digested. 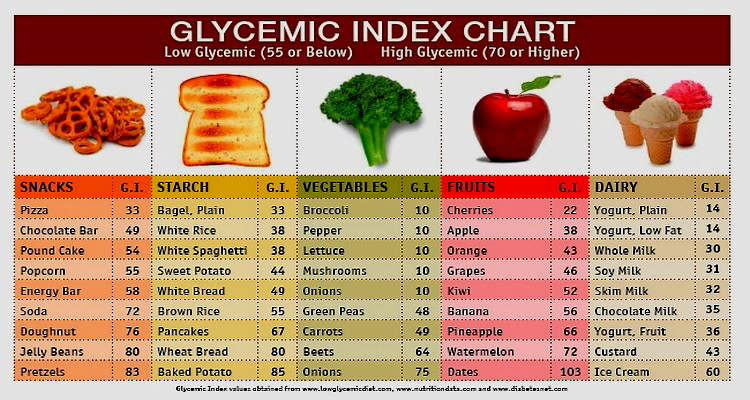 This is also where the glycemic index of foods come in handy. Of course, the amount is also a factor here. Not eating enough could lead to low levels/hypoglycemia. 2. Exercise – the amount of time you exercise as well as the type of exercise. Cardiovascular exercise will decrease your blood sugar more rapidly than strength training. Strength training will immediately increase your blood glucose due to your muscles needing energy for the work they are doing, but then decrease over a longer period of time. Normally if I do any strength training, I will follow this up with 15-20 minutes of cardio to help bring the blood glucose down. 3. Stress – Yes, we all know stress always seems to work against us mentally and physically! When stressed, my blood sugar is 10-15 points higher overall! This makes a huge difference! 4. Hydration – Drinking enough water is so important! If I’m dehydrated, my blood sugar spikes more often, and for longer periods of time. I literally have to set my phone to remind me to drink water sometimes, but it is a must! 5. That ‘Female’ Thing – But of course this wouldn’t help a diabetic’s blood glucose! Hormones never seem to work in our favor. Not only is my body temperature higher, but my blood glucose is at least 10 points higher during this time. 6. Sickness – When sick, my blood sugar can stay high for longer periods of time, especially when I have a fever. It is actually very, very scary when you do everything you can to keep your levels down but don’t see any results. So as you can see, all of these vary on a daily basis. This would mean that a person could have many different sliding scales in a given day. Often times, if we keep the same sliding scale over a large period of time, and with life factors that are constantly changing, we could very well be taking more or less insulin than needed. By taking more, your body stores this as fat. And fat is not my friend. It is true, that I may never have a perfect sliding scale to accommodate my lifestyle. However, I have heard of studies about a fake pancreas which would be amazing. Other than that, us diabetics are kind of screwed. There is never such thing as perfect sliding scale, and therefore, we are constantly battling weight loss in some way, shape or form! Categories: Beginning Blog Posts! | Tags: cardio, diabetes, diabetic, exercise, fat, female, food, hydration, lemon water, life, sickness, strength, stress, type 1, weight, Weight loss | Permalink.